This news is definitely one for the books: Thanks Springwise for the heads-up. I'll definitely be haunting Borders. Better yet, if you'll be passing Heathrow late September, can you grab a copy for me? Please, pretty please?!? I'll be your BFF!!!!!! Alain de Botton, one of the world's most respected authors, has been appointed the first ever airport writer-in-residence to tell the story of a week at Heathrow. Alain's books on love, travel, architecture and literature have become best-sellers in over 30 countries. His latest – A Week at the Airport: A Heathrow Diary – will capture the inner workings of Britain's busiest airport, with its staff and passengers becoming the book's contents. Parts of the book will be written from a desk at Heathrow Terminal 5, allowing passengers travelling through the airport in August to appear as characters in the story. "In the cloudless dawn, a sequence of planes, each visible as a single diamond, had lined up at different heights, like pupils in a school photo, on their final approach to the north runway. Their wings unfolded themselves into elaborate and unlikely arrangements of irregularly sized steel gray panels. Having avoided the earth for so long, wheels that had last touched the ground in San Francisco or Mumbai hesitated and slowed almost to a standstill as they arched and prepared to greet the rubber-stained English tarmac with a burst of smoke that made manifest their planes' speed and weight." Besides publishing at the speed of light and providing Heathrow with some lovely literary publicity, the endeavour taps into two ongoing consumer trends. First off, the status stories element: passengers and staff members are invited to share their stories with De Botton, and have a chance of being immortalized in A Week at the Airport. 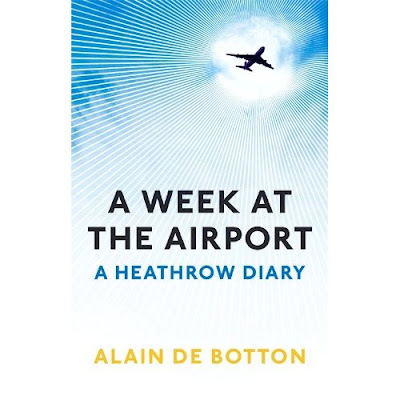 Secondly, a generous dose of free love: Heathrow will be handing out 10,000 copies of De Botton's diary to passengers travelling through the airport. Smart marketing move by Heathrow, and one for any other brand to be inspired by: be delightful, be relevant, be generous.